Or view larger version. 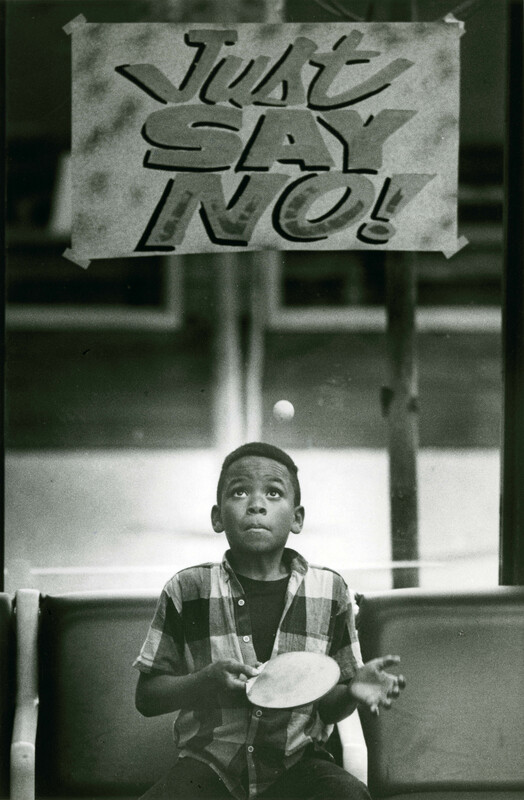 At the Richmond Boys Club, a sign urging young people to "say no" to drugs. December 15, 1989. Michael Macor, photographer. Gelatin silver print. Collection of Oakland Museum of California. The Oakland Tribune Collection. Gift of ANG Newspapers. In this 1989 photo, a young boy plays ping-pong at the Richmond Boys Club. Above him is a sign with the anti-drug slogan "Just Say No!" originally promoted by the Reagan Administration in 1984 to coincide with the administration's War on Drugs.